An Iranian man who converted to Christianity after discovering it was a peaceful religion in contrast to Islam had his asylum claim rejected by the Home Office on March 19th. In a rejection letter from the Home Office, passages with violent imagery from the Bible including Matthew, Revelation, and Exodus were used to argue that the claimant's claim about Christianity was false. 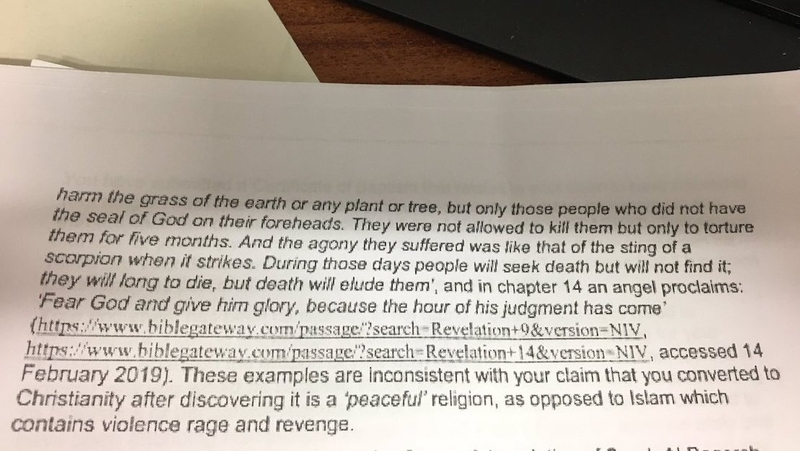 “These examples are inconsistent with your claim that you converted to Christianity after discovering it is a ‘peaceful religion’ as opposed to Islam, which contained violence and rage,” the letter read. The Home Office later said the letter was "not in accordance with our policy approach to claims based on religious persecution" and agreed to reconsider the application. The letter, made public on Twitter by the man's immigration case worker, drew swift criticism from various Christian leaders. Archbishop Angaelos, the Coptic Orthodox Archbishop of London, said the incident caused him "great concern." "It must be determined whether this is merely out of misunderstanding or a proactive attempt to adversely affect the application of someone whose life may very literally be at risk. It must also be ascertained as to whether religious discrimination is at work, as there is no place for partiality within a Government that seeks to promote equality," the archbishop said in a statement. Angaelos said that since the publication of the Iranian Christian’s asylum rejection letter, "other examples have also arisen of similar malpractices when it comes to misrepresenting Scripture and rejecting asylum claims on those grounds, and so I do hope that these are also looked at in their entirety, and not a single case in isolation." The archbishop added that "we must realize the extent of these actions, and that they have a bearing on people of faith who are potentially vulnerable in their state of origin, and vulnerable here in Britain as asylum seekers, and for this we must take great care to ensure that such violations do not go undetected or untreated." "I am extremely concerned that a Government department could determine the future of another human being based on such a profound misunderstanding of the texts and practices of faith communities.... It is good that the Home Office has recognised that this decision is inconsistent with its policies and that its staff need better training, but the fact that these comments were made at all suggests that the problem goes deeper than a lack of religious literacy among individual civil servants and indicates that the management structures and ethos of the Home Office, when dealing with cases with a religious dimension, need serious overhaul." Sarah Teather, the director of the Jesuit Refugee Service UK, said the letter is evidence the Home Office is “willing to distort any aspect of reality” to turn down asylum claims, saying this case "demonstrates the shocking illiteracy of Christianity within the Home Office. But the distortion of logic and reckless approach to asylum seeker’s lives is a common feature. Here at JRS, we routinely encounter cases where asylum has been refused on spurious grounds. Some of these cases require more legal knowledge to recognise than this bizarre misquoting of the bible.